sites, that results in free exposure (e.g. advertising) for you. 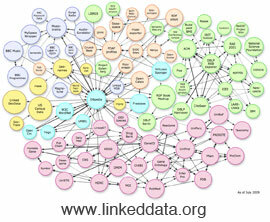 Learn more at Linked Data. FacetNow provides developers affordable access to a new class of powerful inference engine, a software program that attempts to derive answers from a knowledge base of products, reviews, and locations across the Linked Data Universe. Systems that use inference engines are also called Expert Systems, and are the central processors for navigating the ever expanding Internet faster, easier, and with greater relevance. This is a core distinguishing factor between slower, less accurate Old Paradigm web 1.0 and web 2.0 sites, and the "high resolution" real-time New Paradigm web 3.0. FacetNow is built on 100% semantic technology, which depends on structured metadata called ontologies. FacetNow uses ontologies to revise and update the application experience with new features and capabilities, faster, and less expensively than Old Paradigm methods. As a result, users get access to the most cutting edge feature updates for an always-current, powerful, seamless experience.